Clyde boss Danny Lennon says it’s important his side retain their self-belief as they embark on the vital run-in to the end of the season. Promotion chasing Bully Wee return to action after last week’s break on Saturday with the visit to Broadwood of a revitalised Cowdenbeath. Having finished bottom of League Two for the past two seasons, the Fifers are much improved this time round. 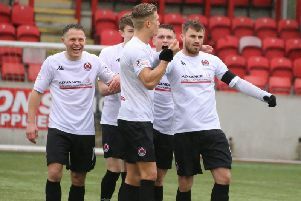 They sit fifth in the table and honours are even in their three league and cup matches with Clyde this season which have produced a win apiece and a draw. But former Cowden boss Lennon, while taking nothing for granted against Gary Bollan’s side, feels his players should focus more on their own game, rather than the dangers posed by their opponents. He said: “We know how sticky it’s going to be, they’re a team that have got a little bit of momentum themselves. They’ve won back to back games and look very much improved from last season. “We know the challenge they will bring and have got to make sure we’re ready. “But while it’s OK respecting other teams we’ve got to keep believing in ourselves and the great work that we’re doing just now. “It’s not just the past few weeks. The level of performance throughout the season has been good. “We’ve not always had the results you want to go along with that. You’ve got to make sure you do right in both boxes and we’re starting to get the rewards of that.